Whether you are just starting out in your first home, or are looking to modernise your family home, it's easier than ever before to transform your living space into something that is stylish and modern as well as functional and relaxing. The idea of the perfect home varies from person to person. One individual’s idea of a safe haven differs from the next, but one thing most can agree on is the need for a fresh and modern interior, free of clutter. Ahh, bliss! In order to achieve a stylish home, the work required can range from small and subtle changes from revamping your staircase with new parts and the right lighting to LPD doors to give your home a refreshed aesthetic. For five simple steps that will modernise your home in next to no time at all, please keep reading. The first step in any home improvement process is clearing away any mess and clutter that has built up over time. It is far too easy to hold on to stuff for far too long that will never get used, so why not have a spring clean? Throw away anything that hasn't been used in six months that holds no sentimental value, and re-organise everything that's left. Storage furniture is more aesthetically pleasing than ever before, so don't be afraid to have a move around and make the most of your available space. Review each room of your house and carefully consider how you use each room. Once this is complete, and you know what you will be looking to invest in, ensure that everything matches the décor and overall theme. If your kitchen is the heart of your home but can feel a little dark, brighten it up with some fresh new curtains or a lick of paint. Similarly, if your living room is for relaxing but feels too busy, mute down the colour scheme and opt for something more neutral. Sometimes all it takes to revitalise a home is small and unobtrusive changes. If your home decor is perfect as it is, and your accessories and knick knacks are just how you like them, you can create a whole new look in just a few hours by investing in some new staircase parts. Whether you think your home would benefit from new spindles and newel posts, or from stripping the carpet and adding staircase cladding, there are so many easy options available. Alternatively, glass balustrades can really open up a home and give the illusion of more space without actually moving a thing. This will go some way towards opening up your home and avoiding feeling as though you are confined. 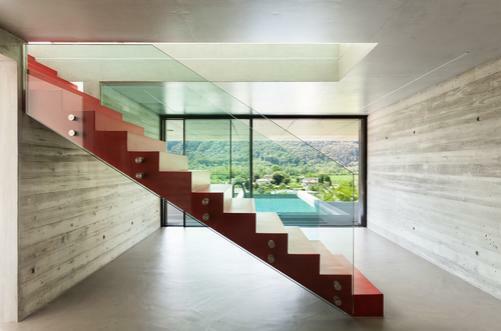 Glass is going to be big this year, so stay ahead of the crowd and update your stairs in a stylish and modern way. Over winter, it can be easy to overload on dark and intense colours and keep those heavy curtains shut to keep out the cold outside world. With the emergence of spring and summer on the horizon, open up your home and let there be light! Invite the sunshine into your home by opening up your living space. Clear space in front of windows and flood your home with daylight! Every home has doors and their appearance is vital! If your interior doors are looking a little dated, then why not upgrade with some LPD Doors? Not only are they stylish and fresh, but they're strong and sturdy while fitting in with the modern home interior. What's more, they give you privacy where needed without looking overbearing! We call that a win-win. So, there you have it. Five quick and easy ways to modernise your home ready for spring summer 2017. If you would like more information about how Blueprint Joinery can improve your home, please call our team today on 01691 671020.